yesterday we decided to go scouting for bridal shops (apparently everyone uses the acronym 'BS' which is so hilarious the first time i found out LOL). so we drove ourselves to SS2 where it's like 'land of bridal shops'! we had no BS in mind, so we simply drove to one of the shops - Lasposa. We spoke to a guy there whom i think is the owner. he first showed us the gowns as he said that a shops' gowns are one of the top choosing factors for BTBs (bride to be). no clue in mind, i just followed him. upon reaching upstairs, it was a big room filllllled with wedding gowns and evening gowns. i was in awe as there were really sooo many selections to choose from. but i didnt spend much time looking thru all the gowns though, as i think i'll settle for something quite easily haha. he then proceeded to show us his photography samples. he showed us so many until ys and i were abt to fall asleep. the pictures were quite nice, satisfying and acceptable. he was also quite nice, explained the full package to us and was not pushy. but had to speak cantonese or mandarin to him cos he dunno english. and then, he told us there was a bridal fair on-going this weekend (!!!!!!) wow! what a luck! so he told us his promotions and freebies that he will be giving for this weekend. and ys, being so easily influenced, want to take it ade haha. but of cos i held back and said we'll think abt it. 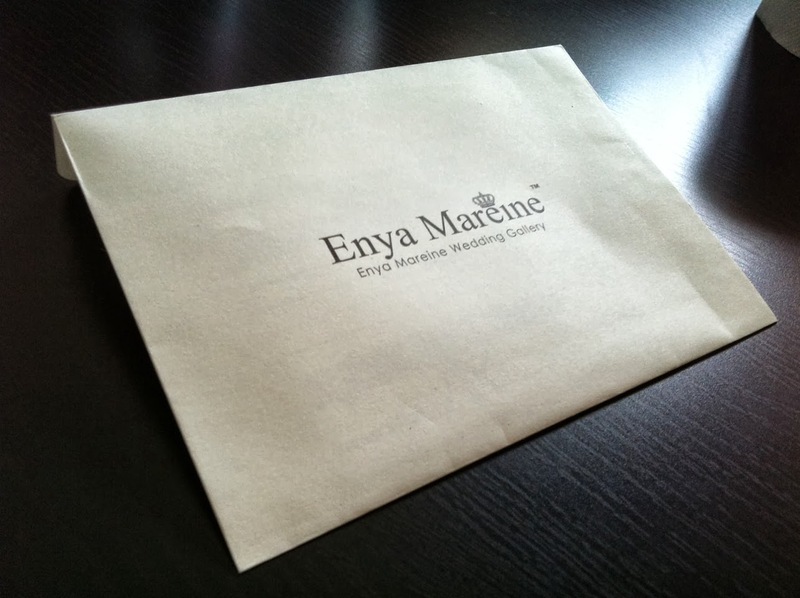 and also i hvnt done any research on the net, dunno he got good or bad reviews..
after that, we went to the next shop - Enya Mareine. this shop looked high-class and expensive, and i had a preset mind of going in only to check out what they have to offer, but not take the deal. we had to wait a while for someone to come assist us as it looked like they were shorthanded, probly due to half their staff being at the bridal fair. so in the meantime they gave us an album to see. the moment we saw the first picture on the cover, we were both impressed already! after flipping thru, we could see that these phots were realllly of quality. and the way they added effects on the pix, ys and i really loved!! then a lady came, Katrine, and she showed us more pix on the iPad and we both fell in love with it. they also had promotions for the bridal fair, but even after discounted price it was still about 50% more than others. after that we went to RedBliss. they were also short-staffed as most of them were at the bridal fair in Mid Valley, so we flipped thru some albums first. we straight away can see the quality difference in this one.. real lousy. and their layout design was also super ugly and cinapek. then a girl came, explained to us their good albums were taken to the fair and asked to show us the pix on the computer. thinking there's still hope, we see what she had to offer as she said she's going to show us their new photography concept. when we saw the pix.. O. M. G. it looked like a secondary school project!! wth! ys was already turned off and he shut his mind already hahah. i just quickly asked her abt the packages, and it was not cheap also, then we went off. and in the car we were making fun of them already. we saw Enya booth there also and again impressed, but apparently they didnt gv discount here, only Katrine gave us discount, and they were surprised also. so we walked a bit more and talked to some other shops also. and no one was as pushy as Touch! omg! then we came back and think abt it and do some research. apparently Touch have a lot of complaints, definitely NOT going for them. Lasposa had quite good reviews and so did Enya. but $$$ is really an issue. i spent the whole night thinking abt it, i was in a real dilemma - to spend more money on smth you love or spend less on smth acceptable... i decided to go for Lasposa, but in my heart i felt sad :( . Copyright © 2011 happie ever after . All Rights Reserved.